This year’s Halfords Tour Series will end with two rounds in Stoke-on-Trent on June 14 – one of which will be a team time trial. The official series launch took place in the Potteries this morning to coincide with the Grand Final of this year’s event that will take place in the city on June 14. In an attempt to ensure the competition goes down to the wire, the schedule has been twisted. The series had already been extended to 11 rounds with the insertion of a Friday night race in Aberystwyth (May 25), and the inclusion of a mid-afternoon, 2.4km team time trial in addition to the hour-long evening criterium in Stoke takes the event up to an unprecedented 12 races. Event organiser SweetSpot is keen to avoid a repeat of last year’s results, in which a dominant Rapha-Condor-Sharp team won five out of the opening eight rounds, and only needed to finish seventh in the final race to secure the victory. Two two-lap team time trial is likely to throw up some surprises, particularly as very few British teams have experience of them. At the time of writing, Endura Racing are the only competing team to have come across this discipline in 2012 (at the Settimana Internazionale Coppi e Bartoli and Circuit des Ardennes International stage races). Having worked on their technique at their training camp in Majorca, they finished second in both. 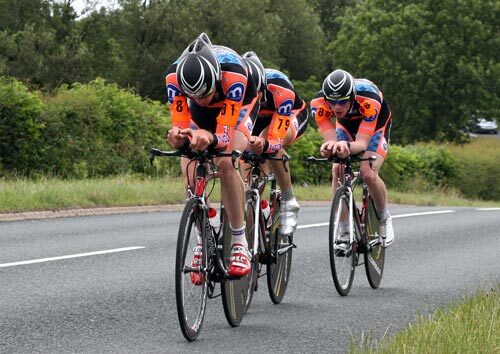 Rapha and Node4-Giordana (under their former guise of Motorpoint) rode at least one TTT each in 2011, while CyclePremier finished second in the RTTC Team Time Trial Championships last year, but those riders (Dale Appleby, Tony Gibb and Si Wilson) now ride for Metaltek-Scott. However, over such a short distance, past form may be of little relevance anyway. SweetSpot has also confirmed that Pedal Power-Endura-Forme Racing and VanillaBikes.com will be the guest teams for the opening round in Kirkcaldy, while teamwallis-CHH will ride in Aberystwyth. The final round of the women’s Johnson Health Tech Grand Prix series will also be staged in between the two men’s races in Stoke.